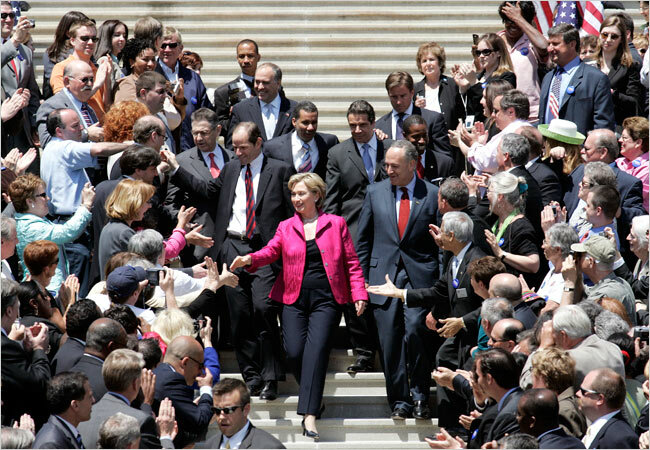 Hillary as NY guv anew? SEN. Hillary Clinton leaves the New York Capitol in May after being endorsed for president by state Democratic leaders, including then Gov. Elliot Spitzer to her rear right, but a Clinton spokesman said she would not run for governor. ALBANY – It would mean more trips to Rome, N.Y., than Rome, Italy, more dinners with state legislators than dinners with heads of state. But should Senator Hillary Rodham Clinton run for governor of New York rather than president of the United States, some things would be familiar: outraged Republicans, legislative gridlock and many men who have never had a woman for a boss. At least some New York Democrats have reportedly been pitching the Executive Mansion as a kind of consolation prize for Mrs. Clinton – a face-saving exit to the presidential primary that they believe she cannot win and that, they fear, is tearing the party apart. The notion of a Clinton run for governor, floated in Newsweek last month and recycled on blogs and talk shows since, is flatly rejected by Mrs. Clinton’s aides and closest supporters, and many others in New York politics. Even hypothetically, she would face any number of obstacles, starting with the practical and political unpalatability of running against the incumbent, David A. Paterson, who despite early stumbles remains a well-liked fellow Democrat and is New York’s first black governor. But that has not stopped the chatter. After all, some noted, there was a time when few believed the rumblings that Mrs. Clinton would run for president. “It looks like she’s not going to win the presidency, so I guess you’ve got to figure out where she’s going next,” said Douglas A. Muzzio, a professor at the Baruch College School of Public Affairs. Those New York Democrats who were willing to talk on the record about the possibility of a Governor Clinton unfailingly emphasized their belief that she would be taking up residence in the White House come next year. But some conceded that the governor idea had its attractions – in theory, of course. “Especially since I’m supporting her for president, I would say she certainly could do a bang-up job as governor of the state,” said Assemblyman Joseph R. Lentol, a prominent Clinton backer in New York. Howard Wolfson, a spokesman for Mrs. Clinton, dismissed the idea on Tuesday, saying that she would support Mr. Paterson. Still, based on her experience in the Senate, some said, it is possible to imagine Mrs. Clinton having a smooth transition to Albany, especially compared with that of Eliot Spitzer, who entered office in 2007 as a political star in his own right. Upon arriving in Washington, Mrs. Clinton worked diligently to play down her celebrity. She devoted herself to bread-and-butter New York issues, sought out senior senators as mentors and reached across the aisle to prominent Republicans who tormented her husband during his presidency. After a tumultuous year of political battles between Mr. Spitzer and the Legislature, Mrs. Clinton’s fans say, Albany could use that kind of touch. New Yorkers have always preferred their politicians to be larger than life – one factor, arguably, in their openness to making Mrs. Clinton a senator in 2000 despite her shallow roots in the state. Some of her fellow Democrats might have similar feelings, especially those who have been patiently waiting for Mrs. Clinton to depart New York’s political sandbox and pave the way for a successor. And any challenge to Mr. Paterson, a Clinton friend who has campaigned extensively for her, would carry particular risks. Mr. Paterson, who is serving out the remainder of Mr. Spitzer’s term, has indicated that he is likely to run in 2010. Mrs. Clinton has already dismayed some black voters by running against Barack Obama, a fellow Democratic senator. Any effort to nudge Mr. Paterson aside could provoke a deadly backlash from black voters. Indeed, several people said they assumed that Mr. Obama’s supporters were circulating the rumor in part to damage Mrs. Clinton in the Pennsylvania primary next week. “Even if it were real, it would destroy her potential base vote among blacks and boost up black turnout for Obama,” said Hank Sheinkopf, a New York political consultant who worked on Bill Clinton’s 1996 presidential campaign. Another Clinton supporter, an elected official from New York City who spoke anonymously for fear of offending Mrs. Clinton, said it was hard to imagine her ever running for governor. She would not even consider it, the official said, unless Mr. Paterson had been too weakened by his admissions of drug use and marital infidelity to stand for re-election, and party leaders appealed to her to run. For the moment, however, Albany Republicans and Democrats alike appear eager to give the new governor a honeymoon. And polls show Mr. Paterson with fairly high approval ratings despite his rocky early weeks in office. New York Democrats, Mr. Lentol asserted, did not need a savior.